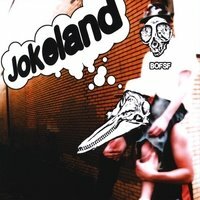 A chaotic fun-house of an album that can be distinctly unsettling, and oddly comforting at other times, Jokeland doesn’t just play in the background, it assaults you. Flashes of Tom Waits (“Grap Strap”) and Talking Heads (“Finn McCools”) are present but the main inspiration seems to come right from the Captain Beefheart himself. Spastic singing in all ranges, a marching band variety of instruments, found sounds, anything is fair game. A pump organ and a screeching Sax can appear, sometimes only for a measure, before dissolving into a religious chant in the next. At times it feels as the disk is skipping (“Doops”) and at others it feels as it is stuck to the bottom of the player with taffy (“Boats”). The best tunes are the early ones, “DaVinci Toad” rocks and “Mugs” works real well. Other tracks show promise but get so weighed down with nonsense lyrics (“Finn McCools”, “Bertie Hey” etc…) they distract rather then enhance the song presented and that seems to be a reoccurring problem for the group; chill out for a second fellas. Currently bands such as Man Man, Akron/Family and Animal Collective do things in the same exaggerated; toss-the-whole-pasta-colander-at-the-wall-and-see-what-sticks ethos. The truth is most of these bands need to be experienced live for their sensory overload to be appreciated properly, on disk it can become distracting, organized and surprisingly uninteresting. When change is constant, normality quickly becomes a needed change. While not always successful, Ball of Flame Shoot Fire is nothing if not adventurous, and that should be applauded, but too frequently Jokeland floats into ADD snippets, not songs. A few more thoughts, a video and a one word review (now that I tricked you into reading that) after the jump...When I first caught ManMan live at Siren Fest back in 06 I was blown away and they were my surprise highlight of the day. When I purchased Man Man's most recent album Rabbit Habbits I was let down...things weren't the same as on that sunny day. Sure I am sucker for the live show over the solo listening experience any day of the week, but this style of music, and I am obviously lumping Ball of Flame Shoot Fire into this category just losses something for me if I can't see the storm of notes brewing in front of me.